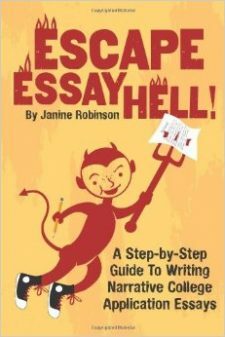 So many students have trouble finding an essay topic. It is such a tough assignment to be asked to write a short essay that shows what you are about. The tendency is to try to include as many cool things as possible–their good works, their achievements, their everything. When students try to cram too many points or subjects into their essays, they become broad and the meaning and ideas then spread thin. Students who understand the idea of picking one smaller highlight or mini-story and use that to illustrate something about themselves tend to produce essays that naturally reveal something deeper. Think of how water sinks into the ground: wide and shallow, or contained and deep. It’s one of those things that is hard to explain, but easier to recognize when you see it. You can see how these students could describe these little moments and then develop them into metaphors about their interests and passions and show something about who they are. Aren’t these so much better than “I love to cook” or “I am passionate about French”? Read about how you can tell a story and how to write anecdote in your college application essay. So, start small and see where it takes you! Read this post on how to find a topic for your college application essay!